Q: Why does a traffic light turn red? A: If you had to change in front of everyone, you’d turn red, too. *Freeway congestion is getting so bad, you can change a tire without losing your place in line. *Traffic is always heavy in both directions. There are just as many people trying to get to whatever you’re trying to get away from. *The only way to get home from work on time is to take the day off …. even then, you’re cutting it close. 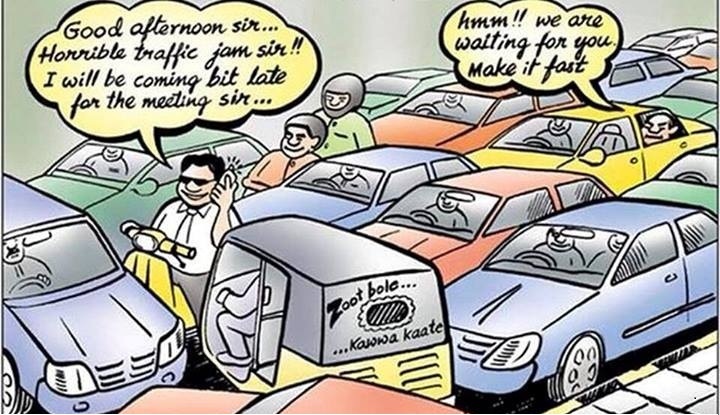 *Traffic is so bad nowadays, a pedestrian is someone in a hurry. *You can sit on the highways forever. In fact, some places have little exit ramps where you can pull over and make a car payment. *During rush hour the only way you can change lanes is to buy the car driving next to you. *Our highways have become insane asylums with turn signals. *You have mixed feelings when you see an opening in rush hour traffic. You’re glad for the opening, but you wonder who died. Last time they were visiting, he got pulled over by a cop and, in the middle of getting the ticket, politely disagreed and drove away.